In 1999, acting on orders from El Paso zoo's director David Zucconi, zoo employees beat Sissy the elephant for several hours with ax handles. It was common practice in the zoo business to beat elephants to teach them "respect" for their keepers. Thanks to the media exposure of this particular beating as well as other atrocities at the zoo, activists were eventually successful and Sissy was released to The Elephant Sanctuary in January 2000. The Elephant Sanctuary in Tennessee is now home to five elephants age 50 or older. Shirley, the third oldest Asian elephant in North America is 69; Billie is 55; Minnie and Ronnie are 51—and on January 26, 2018—we celebrated Sissy’s 50th birthday. Elephants in the wild can live to be 60 to 70 years while the average age of a captive elephant is only 40 years. Chronic, progressive conditions such as arthritis and foot disease affect many captive elephants, as do opportunistic diseases such as TB. However, with individualized care, captive elephants can and do live longer than average—sometimes much longer, like Shirley. 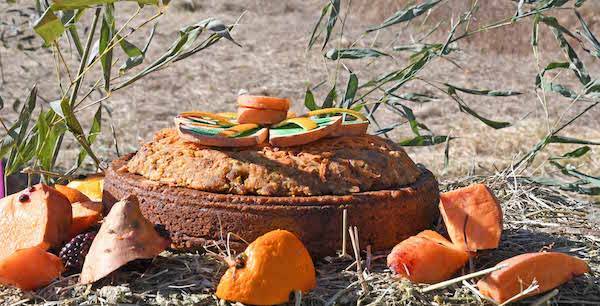 To celebrate Sissy’s milestone birthday, Caregivers baked her a vegan carrot cake and surrounded it with sweet potato and fresh fruit. 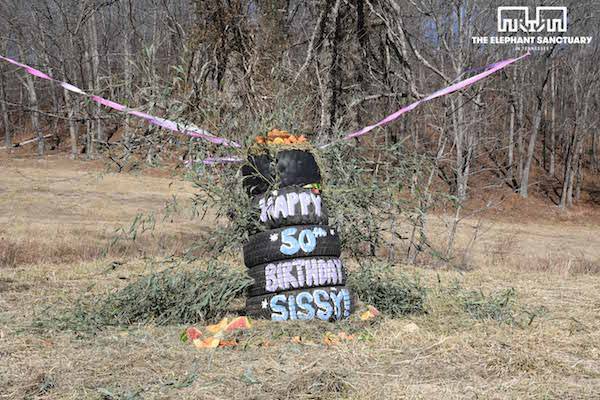 They also created a mound of tires filled with bamboo and fresh produce for Sissy to enjoy. Sissy was captured in Thailand as a calf, and first appeared in the United States on exhibit at Six Flags Over Texas amusement park in 1969. By year’s end, Sissy was sold to the Frank Buck Zoo in Gainesville, TX, to replace the zoo’s recently deceased elephant, Gerry. Renamed “Gerry II,” Sissy spent the next three decades as the focal point of the zoo, surviving a record flood after being submerged for a day and a half with only her trunk above water allowing her to breathe. Sissy was moved to the Houston Zoo, and later the El Paso Zoo. The El Paso community spoke out to have Sissy retired and in January 2000, Sissy joined Tarra, Bunny, Shirley, Jenny and Barbara at The Elephant Sanctuary. Reserved and cautious at first, Sissy soon began to venture farther out into the habitat, socializing with the others, especially Winkie, her closest companion. After Winkie’s passing in 2017, Sissy joined the elephants in Q Habitat. Slow introductions are essential to the development of bonded relationships of non-related elephants. Sissy has been spending time with Ronnie and Minnie—even napping beside Minnie in the sun—and continues to share a fence line with Debbie and Billie. Care Staff look forward to watching bonded relationships form between all of the Q elephants. Last November (1999) we ran the story of how El Paso Zoo employees, acting on orders from our zoo's director David Zucconi, beat Sissy the elephant for several hours with ax handles. Many citizens of El Paso were outraged when they learned of this event from the local papers and saw the videotape of the beating on the local tv news. Many probably still don't know that it is common practice in the zoo business to beat elephants to teach them "respect" for their keepers. This event did allow the El Paso animal advocacy group, Voice for All Animals, to focus attention on a number of problems at the zoo. Seals and sea lions are kept in small chlorinated freshwater pools, instead of the somewhat more natural salt water enclosures, featured at other zoos. Sunny the sea lion is suffering from cataracts caused by unfiltered sunlight shining through clear water, and has developed seizures caused by the chlorine. Most of the enclosures are too small for the animals imprisoned by our city. Many of the animals can barely tolerate the over 100 degree temperatures of El Paso summers. Thanks to the work of El Paso's Voice for All Animals, the beating of Sissy was brought to national attention. Emails poured in to city officials from Animal Rights Online readers as well as from other animal advocates around the country. 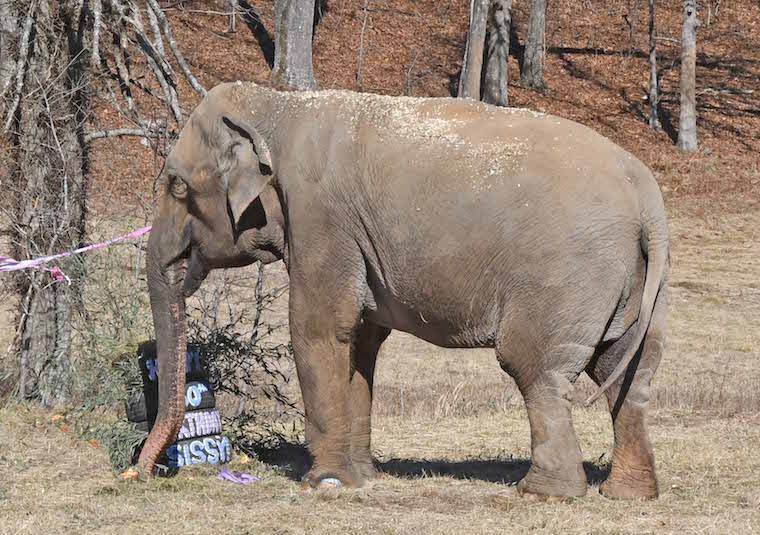 Our city council quickly agreed to the demands of an irate public to retire Sissy to the Elephant Sanctuary in Tennessee. Sissy will leave El Paso on January 24th, 2000, for a much better life.